TOYDOZER GIVEAWAY – How many times have you seen a new product and wanted to give yourself the patented “I could have had a V-8” head slap? This post is about just such a product. The moment I saw it, I loved the Toydozer. And what is even cooler is it was invented by a parent just like us. 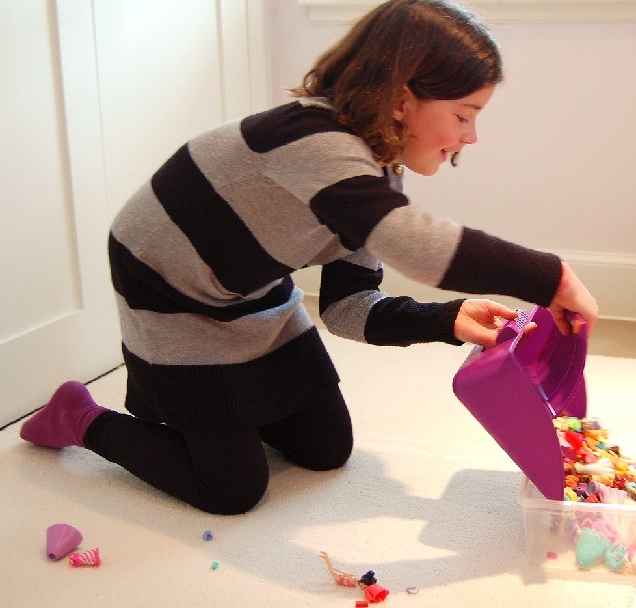 As mom to seven-year-old Harry, Toydozer creator, Amy Bradley knows what it is like to be constantly picking up toys. Do you know that feeling? I sure do. At the end of a long day, I dreaded cleaning up all of my son’s toys — whether it was trains, safari animals, Duplo blocks or LEGOS — spread out all over the floor. Its genius is in its sturdy simplicity. Hold the “gatherer” to collect small toys into the lightweight “scoop” (modeled after a dump truck), thus the name. My daughter is only 3½ years old, and this product did the nearly impossible. Not only did she clean up all of her toys, but she had fun doing it! I’m pleased to offer you a chance to win your very own Toydozer. Follow the instructions below for a number of very easy ways to win! Also, if you don’t want to enter, but would like to just buy one, use the code BLOGGER20 for 20% off at Toydozer.com. 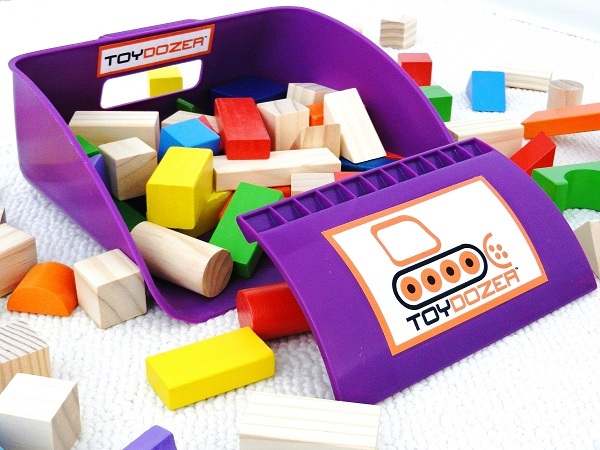 The Toydozer retails for only $18.99 and ships free anywhere in the U.S. or Canada. 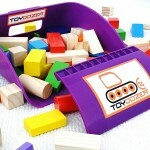 The Toydozer is available exclusively on the toydozer.com website. The product comes in 3 colors: blue, yellow and purple. Each Toydozer features orange Velcro tabs that attach the gatherer to the scoop when not in use for easy storage. This post is part of a Toydozer blogger outreach campaign. Participating bloggers have been provided with a complimentary Toydozer to review and have been compensated for their time. Such a nice giveaway! These types of toys are the favorites of the son of my neighbor (and so hard to pick up). I think I’ve found the right birthday present for him (or his mom). I would be very happy to win this! We just recently received one as a gift so I’m not going to enter your giveaway so to give someone else a chance. But let me say that it’s AWESOME!!!! Hi Kristi. Thanks so much for stopping by and giving your opinion on the Toydozer. Some of the best and most useful things are also the simplest. And one of the reasons I wanted to promote this was the fact that a mom invented it. I love supporting people who come up with cool innovative ideas like this. Even though you have one, please feel free to enter. You can always give it away to a friend. Thanks again for stopping by! It looks like a toy itself. This will make clean up much smoother. My kids can really wreck a room! Boy do I understand how fast kids can “wreck a room” as you say. 🙂 We just have one 3 year old, but can get her toys spread across the floor faster than I’d believe possible. I’d have never believed how easy something like the Toydozer could make cleanup. And you’re right. 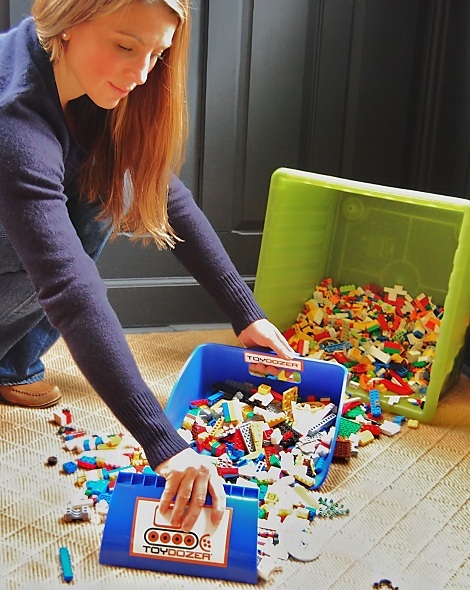 The fact that it looks like a toy makes helping clean up after themselves a game instead of a chore to kids! Happy to see you again, btw. Thanks for stopping by! All those little doll toys are so tiny and a pain to pick up- this would be great! Our daughter has some of those tiny Disney Princess dolls, and she takes off their dresses and stuff. In 5 minutes time there are so many little things covering the floor. The Toydozer scoop makes it super easy to get them up. Thanks for stopping by, Shannon! Okay, now that’s a cool idea. I’m constantly stepping on legos and those little buggers hurt! This would be perfect for picking up our son’s toys! I hope I win! Thanks for this giveaway. Oh, I know just what you mean, Shelly! I cross the living room in the dark barefoot some nights and OUCH! Good luck with the contest. Don’t forget that even if you don’t win, there’s a 20% discount code up above, and shipping is included. Honestly this product is a steal! It is amazing how much mess a little person can make, I am forever cleaning up after him as he has learnt to throw his toys around! Hi Bex. Yes, it’s disproportionate to their size how much destruction they can wreak. Thanks so much for stopping by! Wow! I really would like to win these toys, my little son would be so happy about them! A toy dozer is a great idea! Right? Simple, elegant and very functional. 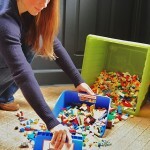 What a super idea to make cleaning up a fun play activity. 🙂 Thanks, Jill! The toy I get to pick up most often? Cars. Lots of cars. My son just started getting HotWheels – we have 30 already. How do they multiply so fast??? I hear you. My brother and I were big into Hot Wheels as kids. Don’t think we had 30, though. At our house it’s tiny princess doll stuff, LEGOS and Jenga blocks. Those legos hurt when you step on them in the dark! That is so awesome! Although the show shovel works well too! (no no really I don’t use it but some days I want to! And since “beaming toys back into place” isn’t avaiable….this seems pretty. This looks like a great cleaning tool. Thank you, D. Yes, it’s very cool. Any way you can make clean up fun (for our kids or even ourselves) I’m a big fan of. Legos! They drive me nuts! Stepping on Legos in the dark really hurt! Good luck winning one of these, Xiomara! It will really help picking up after that little boy of yours. I just visited your blog. How do you like Weebly.com as a site hosting service? I’ve never used them. Oh, and I’m your newest follower on Twitter. Oh yeah….how many products do you just say, “Why didn’t I think of that?” This is one of them. But I plan on teaching my 5 year old to use it, not me! That’s the whole idea right? Efficiency? If I don’t win it here, he might get it for his birthday! I love your blog, and am a new follower! LOL. Yes, teaching him to use it as a form of play sounds like a great idea. Wasn’t it Tom Sawyer that tricked his friends into paying him to whitewash his fence? Tell your boy you’re not sure you want to let him use it. Make him beg. 😉 As a science, technology, engineering & math expert, I’m not surprised to find you have at least as many social media links on your site as I do. I’m pretty sure I followed, liked, pinned and circled you on all of them. 😉 Good luck winning a Toydozer. Oh, and don’t forget to use the code BLOGGER20 for 20% off at Toydozer.com if you just want to buy one.